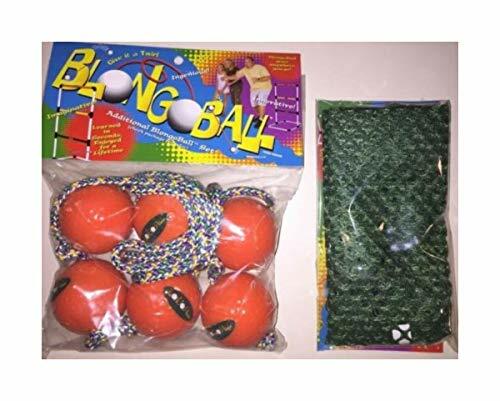 ♣ The Blongo Ball replacement Bolas are the perfect choice for Ladder Toss enthusiasts, whether you are replacing a lost Bola or are building your own Ladder Toss targets and just need the Bolas. This set include 3 Bolas that are made from real golf balls and connected by high density woven nylon. Includes a FREE carry bag! ♣ The Blongo Ball replacement Bolas are the perfect choice for Ladder Toss enthusiasts, whether you are replacing a lost Bola or are building your own Ladder Toss targets and just need the Bolas. ♣ This set include 3 Bolas that are made from real golf balls and connected by high density woven nylon. ♣ Includes a FREE carry bag!